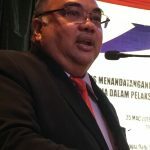 KUCHING: State government-linked companies, agencies and institutions of higher learning have signed up for an environmental awareness programme carried out by the Department of Environment (DOE) Sarawak. The organisations signed a memorandum of understanding (MOU) to enter into a smart and strategic partnership at a local hotel here yesterday. DOE director-general Datuk Dr Ahmad Kamarulnajuib Che Ibrahim, witnessed the MOU signing ceremony between nine organisations and the DOE Sarawak. Kamarulnajiub in his speech congratulated Sarawak Energy for the commitment they had shown in the push for more environmental literacy within the organisation. 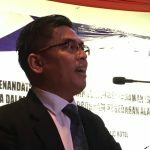 “Sarawak Energy was early to react to our department’s programme and have graciously helped to organize today’s event whit the other nine Sarawak based agencies,” he said. “Our vision in the department is to create a Malaysian public that is in tune with the environment and willing to take the collective responsibility of preserving and protecting the environment from harm. “Sarawak has seen these kinds of programmes before in events such as Enviro Run and Aerobathon organised by Sarawak Energy with cooperation from F&N Beverages, Central Cold Storage Nestle and Mydin Petra Jaya during the national-level Environment Day celebration last year. Sarawak Energy, a Sarawak government owned company, was the host and organiser of the MOU signing ceremony having signed up prior to today’s event and acting as the leading example for the other big companies in Sarawak. “HSSE Sarawak Energy participated in the programme early on and we are committed to the environment awareness programme. Internally we target 100 per cent compliance with all the requirements to become a fully environment-friendly company by next year,” said the group vice-president of HSSE Sarawak Energy, Marconi Madai. The nine organisations that signed the MOU are University Malaysia Sarawak, Kota Samarahan Industrial Training Institute, PPKS Ilmu, Petronas Carigali (Sarawak Oil Asset), Sarawak Shell, Trienekens, Asean Bintulu Fertilizer, Sejingkat Power Corporation, and X-FAB Sarawak. Nine organisations sign MOU on environmental awareness programme 0 out of 5 based on 0 ratings. 0 user reviews.